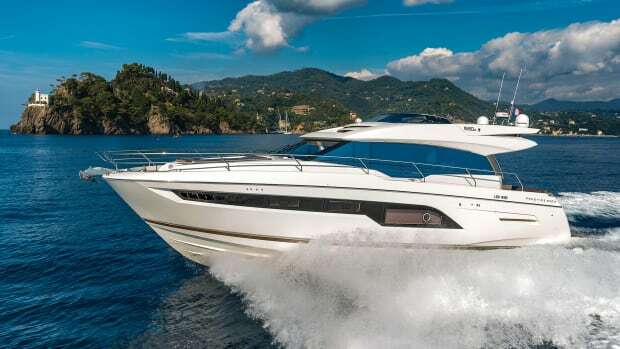 With the 485 HTS, Polish-builder Galeon has set out to provide a high level of maneuverability and a sporty ride while still maintaining comfort underway. 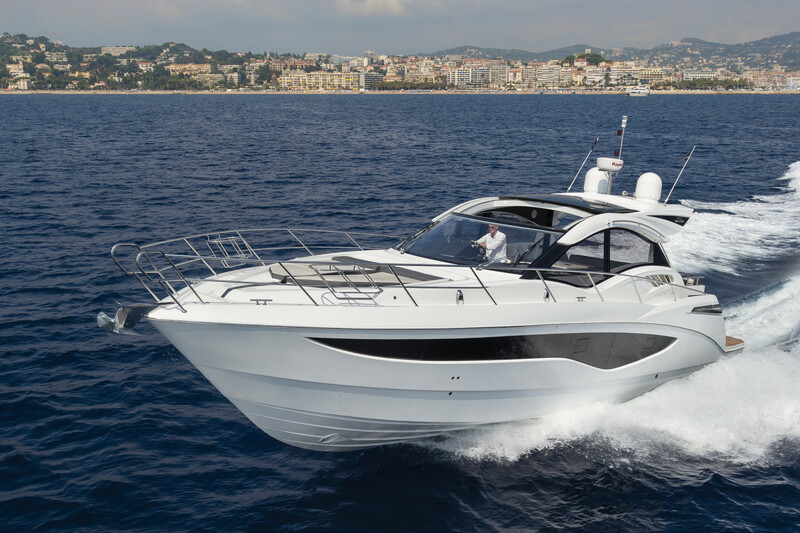 The Galeon 485 HTS builds on the traditions of a successful family business, and takes it one step further. There’s a few things you need to know about ­Galeon to truly appreciate their new 485 HTS. These guys have been serious about building great yachts for decades, they have a large share of the European and South American markets, and they’re now in the U.S. Naming its brand after Spanish galleons, Galeon Yachts is expected to be based in Spain but, no, these yachts are from Poland—way up in the north by the Baltic Sea in a suburb of Gdansk, which has been a byword for shipyards since the 1800s. Galeon is a rarity: family owned in a corporate world, and yet it builds more than 6,000 yachts a year. 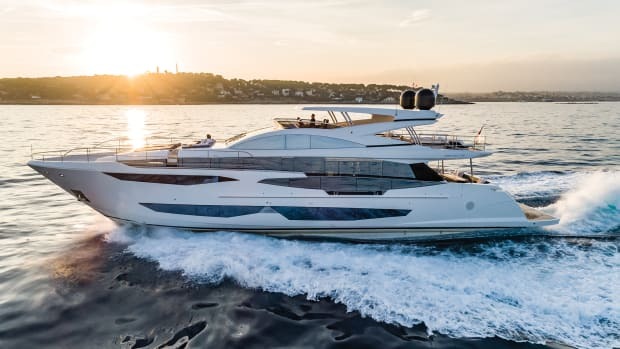 At 30 years old, Galeon is one of the boatbuilding powerhouses of Europe, but it wasn’t until 2016 when Galeon agreed to partner with MarineMax to represent it at their 60-plus stores in the U.S. 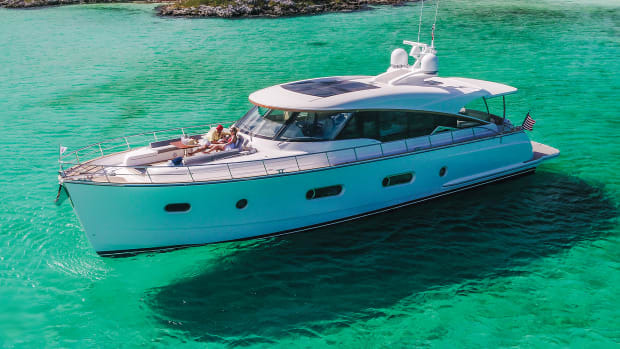 The Galeon yard is a model of modern boatbuilding sophistication, covering more than 6 acres and with 1,700 employees who create everything from the fiberglass molds to metalwork to upholstery. Note the size of the glass in the sunroof. With the amount of natural light these bad boys let in, you’ll truly feel connected to nature. The yard, which also offers a small boat line called Galia, is self-sufficient and, before departure, every yacht goes for a swim in the large test pool to make sure all systems are operating properly. The pool also has an overhead sprinkler system to imitate heavy rain, again to make sure each yacht is ready for turn-key delivery. My take: American boatbuilders should look over their shoulder at what’s coming out of Gdansk. 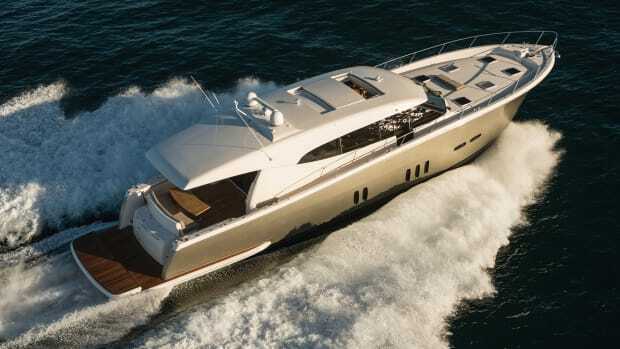 The 485 HTS exudes a muscular toughness under clean hull lines and a swooping superstructure designed by Tony Castro. 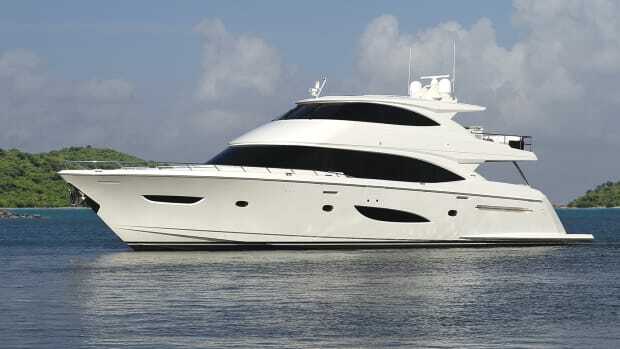 At rest dockside, it’s an imposing yacht that retains an air of class about it. OK, you say, what’s cool about it? First, every boatbuilder has sliding doors between the salon to the cockpit, and they go through endless variations to make them disappear: triple or even quad panels to slide almost out of sight, shallow pockets to half-hide the sliders, and more. Galeon? They make the doors disappear at the push of a button. This is one of those you gotta see this items when showing off your new boat. First, you slide the single main door—a comfortably large one—open. Then you push the button, and both the door and the rear window of the salon slide down into the deck. The result is a salon that’s wide open to the cockpit and vice versa. I’m sure the engineering took a lot of tinkering, but it’s the perfect solution. Want fresh air? Push the button. Want air conditioning or heating? Push the button. From the mirror finish on the brightwork and stainless to the stitching in the leather, the 485 HTS exemplifies Polish craftsmanship. The cockpit has a spacious wraparound dinette, which backs up to the salon dinette so, with the window/door down, so there’s space for the whole big happy family. And if you’re still not getting enough fresh air, the oversized and tinted glass sunroof opens up from the windshield to mid-cabin. 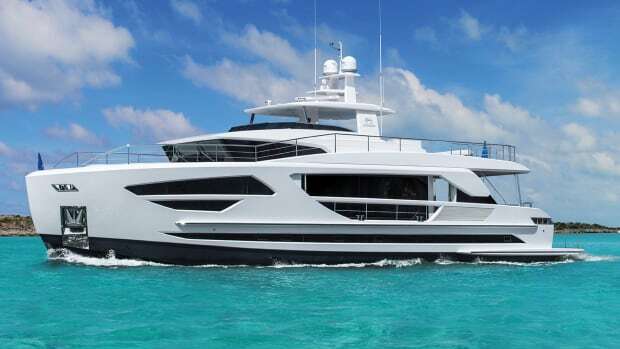 With everything open, this 48-footer is a big runabout. The skipper enjoys a dashboard that seems a bit, er, over designed—at first glance, I thought, “Whoa, too much going on.” But then I sat on the double-wide helm seat, spent some time running the boat, and realized that everything is right where you want it. There’s a centerline Raymarine display just below your line of sight, so you can keep an eye on things without hunting around. The Volvo Penta engine monitor is equally well-placed, and two rows of clearly labeled rocker switches are within easy reach. In road tests, British car magazines used to say “the controls fall readily to hand,” meaning wheel, gear shift, and switches, and that’s exactly the case with the 485. The Volvo multifunction throttle/shifters were right where they were comfortable, followed by the joystick, which is properly located if you want to stand and look around while jogging into a slip. And, unlike many Euro builders that don’t understand the concept of standing while driving, there is 6-foot 7-inch headroom at this helm. With the twin bolsters flipped up, you are perfectly positioned to handle your yacht with the touch of a finger. Just aft of the helm is a wet bar that can be turned into a mini-galley with optional grill and fridge. 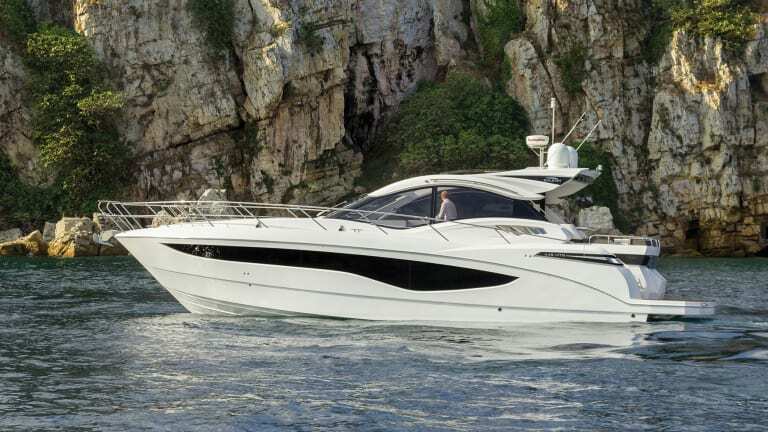 And this leads to another innovative feature on the Galeon 485. 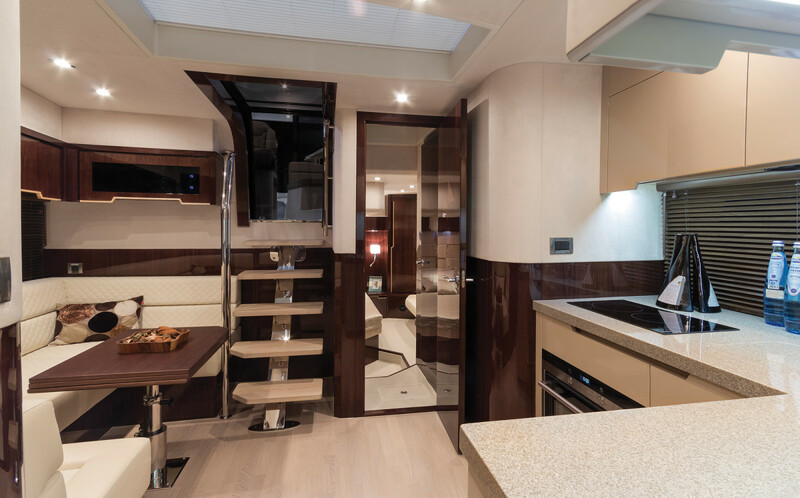 We all know that European builders tend to hide the galley out of sight, but Galeon has turned that around. 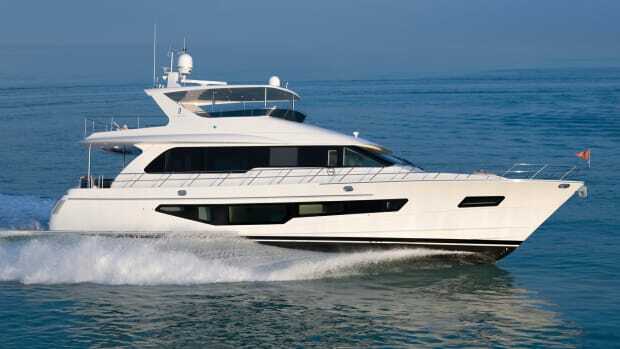 American yachts often have “country kitchens” with main-deck seating around the galley, but Galeon has introduced what might be called the “family galley.” Instead of banishing the cook out of sight, Galeon has created an entire living area around the galley on the lower deck, with a luscious quilted UltraLeather settee, dining table, large TV, and big windows. The chef enjoys an L-shaped workspace with all the usual amenities plus lots of Corian countertop, while family and friends can just hang out. It’s a great place when you’re in a marina and don’t want a highly visible salon galley. Once you’re down on the lower level, with light flooding the area from skylights, the master suite is aft and how sweet it is. It spans the full beam with a queen berth, large credenza to starboard with six doors opening to multiple shelf stowage, and a nearly 6-foot-long loveseat to port. There is an en suite head with folding Lucite doors for the oversized shower stall. 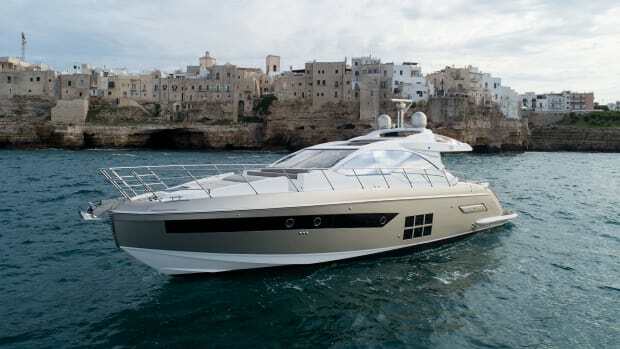 A word about the quality aboard the Galeon 485 HTS: It is way, way out of this class of yacht. Every door is solid wood and the jamb is rubber-lined, so there is a solid thunk when it closes, and then silence inside the stateroom. Poland has been said to have the best welders in the world, and their expertise shows in the jewel-like metalwork, from the double handrails around the foredeck to the stern chocks. Gorgeous. Those same welders have created 316 stainless steel tanks for everything: fuel, water, black water, which will allay any corrosion worries. The same goes for the walnut interior: The woodwork is beautifully inlaid and impeccably finished. Nightstands and side tables are topped with stitched leather. I was also impressed by the teak decks in the cockpit and swim platform (side decks are optional). This wasn’t the usual thin-as-veneer teak, but substantially thick teak that can be sanded for years to come. Speaking of the cockpit, each aft corner has a dedicated line-handling area with sturdy cleats, beautifully crafted stainless steel fairleads and, best of all, a locker underneath for stowing the tail of dock lines out of sight. It even has a drain! The VIP stateroom also has a queen-sized island berth with stowage underneath and, like the master cabin, I was impressed by the hanging lockers. This is where some builders cut corners, adding shelves or placing the coat hanger bars low. 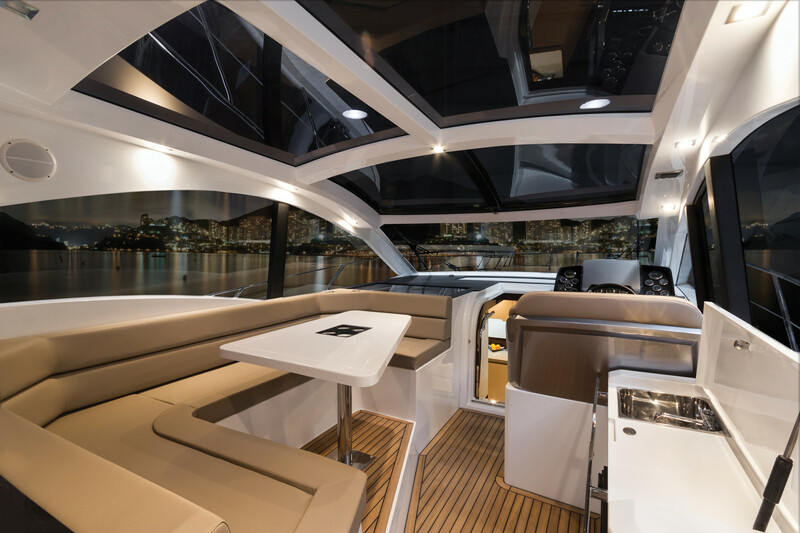 The Galeon 485 has full-length hanging lockers, so pants and dresses won’t end up crumpled on the bottom. Yes, a small touch, but a thoughtful one. The VIP has a door to the dayhead, again nicely finished, and uses a shower curtain with floor drain. The dayhead also opens to the family area with a second door. Another impression of the 485 is skylights here, there, and everywhere. In addition to the opening sunroof in the salon, there are oversized tinted skylights that can be closed off with sliding shades. Aft, our test boat had the optional 4-foot hydraulic swim platform, which can easily carry a tender, although the 485 has a tender garage that is probably best suited for fenders rather than tenders. The hydraulic platform is rated for 660 pounds: think Yamaha V1 or Sea-Doo Spark. The lowering swim platform has another nice touch: stairs rise automatically from the teak platform to make reboarding easy. Forward, a sunpad on the foredeck has a buggy-style flip-up sunshade for at-anchor use. Other niceties include the hidden rode locker with a reversible anchor windlass to raise or lower the hook. Power is a pair of Volvo Penta IPS 600 pods of 435-horsepower each, which include the joystick controls and electronic vessel control system. A hatch in the cockpit floor opens to the engine room, which is surprisingly spacious thanks to the compact pod drive packages, and there’s room for a Fischer Panda 8 kW genset. We topped out at a bit over 32 knots and 44 gph at wide-open throttle, but dropping back to a comfy on-plane cruise speed of 17 knots will use just 21 gph. 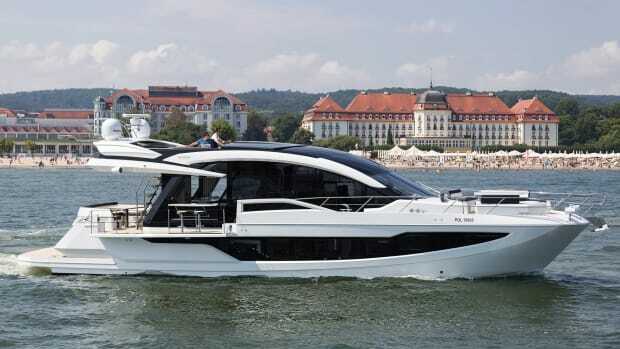 It’s hard to find fault in the Galeon 485 HTS; you can tell I liked her a lot. She punches way above her weight class when it comes to fit and finish, she has head-turning styling, and she’s just as comfortable hosting two couples or a family for lazy weekends. Don’t miss out on this one. Test Conditions: Air temperature: 85°F; humidity: 40%; seas: flat; wind: 6 knots. Load: 125 gal. fuel, 15 gal. water, 2 persons. 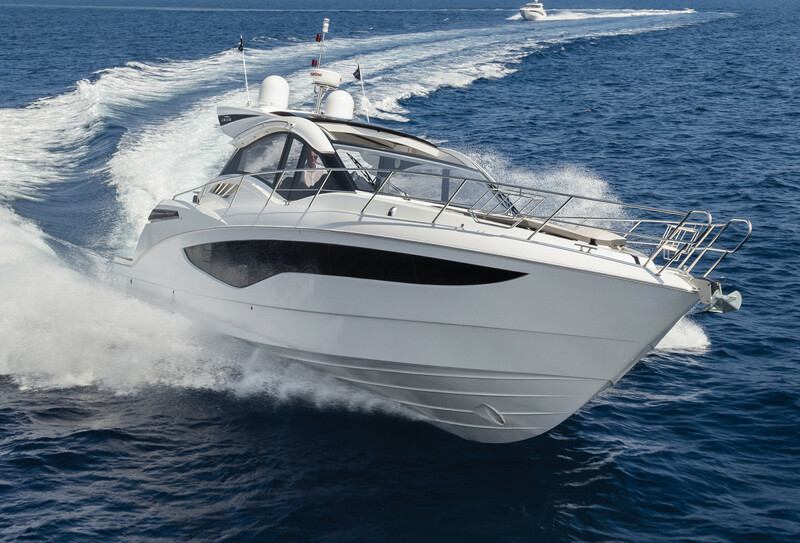 Speeds are two-way averages measured by Raymarine GPS. GPH taken via Volvo Penta display. Range is based on 90% of advertised fuel capacity. Sound levels measured at the helm. 65 dB(A) is the level of normal conversation.